Pride season itself is something to be proud of here in Portland. This month, you can drip sweat (and vodka soda) aboard a boat, in a mock-up of outer space, at a low-key lumberjack convention -- or you can bring your kids (or grown friends) to a drag queen-narrated group story time! And when Pride month finally closes its curtains, you can always hightail it to the clothing-optional Rooster Rock for a very queer, liberating Fourth of July. Leave it to Sordid Lives to find humor in gay conversion therapy. This black comedy’s closing performances are both divisive and timely. Spanning the entirety of Pride month, Sean M. Johnson’s free photo exhibit fearlessly blends queer escapism with death. Each photograph episodically dabbles into the romanticized identity of a different queer person. Join Portland’s most prominent drag queen, Poison Waters, along with a live DJ at this Pride-themed tea party. Pro tip: Don’t expect tea; look for rosé. Pride enthusiasts come in all sizes. Reading Is a Drag! brings together children, free snacks, and prominent Portland drag queens, so kids can experience story time one-on-one or in small groups. Lez Stand Up: 2003 Pride! The only prominent gay thing most people can recall from pop culture in 2003 is the VMA kiss between Britney and Madonna. Still, this doesn’t stop Portland’s leading lesbian comedy troupe from throwing a whole dance party themed after that fateful year. This two-story Pride dance party is out of this world. Case in point: You’ll find galactic go-go dancers, art installations straight outta Star Wars, and premium DJs shipped downstream from Vancouver, BC. The Portland Pride Parade offers a chance to witness every possible facet of queer life complemented with a motorbike or a banner, but look out for two particularly dramatic displays: The Portland Dyke March is PDX Pride’s respective lesbian march and the Portland Trans Pride March highlights every non-cis entry into the community. Though it appears as it sounds, Slant is a queer-only podcast in the making... but Pride month means the pressure is on for all storytellers to appear especially tantalizing. Plenty of gay men are coming out for a second time. This iteration, they want the world to know they’re into flannels and chopping wood. Lumbertwink is a laid-back day-drinking party for bears and bears-in-training during the height of Pride weekend. A '90s-themed Pride dance party housed in a retired pornhouse that’ll leave you smelling like queer spirit. Don’t forget your mullet! We’re here, we’re queer, and we’d like to say... jello shots? 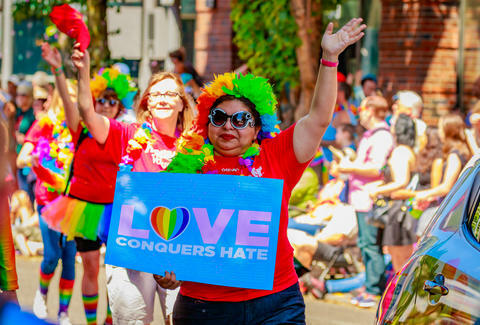 Everybody is making America gay again thanks to the politically poignant theme of this year’s Gaylabration, one of Portland Pride’s official dance parties -- and one of Portland’s biggest. If you’re looking to party this Pride (and you don’t mind waking up counting the ceiling tiles in somebody else’s apartment), the monthly queer dance party Blow Pony is throwing its 10th annual Queer Mutiny Fest. Expect lots of lights, cameras and... action. Big Gay Boat Ride V: The Love Boat! Poison Waters strikes again! This time as your cruise director on this year’s Big Gay Boat Ride, a cruise aboard the Portland Spirit alongside Cynthia Lee Fontaine from RuPaul and plenty of cruising (WINK WINK). If you’ve ever thought about dragging professionally, here’s your chance to break the mold. All headliners at this dance party are performing, but locals can enter the contest, too. This gender-neutral queer dance party stands out from the crowd for several reasons. It tends to specialize in hip-hop, lesbians, and punks. Jack Rushall is a Portland-based freelance writer who likes to open windows. Follow him on Instagram: fromrushallwlove.